The one Ardbeg everyone was waiting for. Hints were given us since a while in the good marketing style of Ardbeg. And know it has lift off. What are we dealing with? Well a first Vintage since a while, this is from 1999 only. It has been taken from ex-bourbon barrels, but also including some cask of Ardbeg matured in ex-Marsala casks. It has been bottled at 49% this year so you say it is 12 year old. Again it is a great success at least here in the Netherlands, it has been launched two days ago and if you want a bottle, you really have to go looking for it; most shops are already sold out, partly due to the ridiculous arrangements with the large retailers. But enough of that, let us go on and taste this new Ardbeg. The colour is a nice mid amber, with a feint red glow. Definitely Ardbeg. Intense smoke and peat, but also quite fruity too, but also somewhat restraint at the first whiff. But then…..it explodes in the hefty smoke combined with smouldering charcoal and grilled fruits. Hints of lemon combines with vanilla and several tropical fruits, thinking of papaya and litchi combined with Lap sang Souchung. Also some honey sweetness and some toasted almonds are appearing in the playing field as do some spices as toasted black pepper corns. Not overpowering. Ashy with cinnamon and dried fruits, also getting some hints of Zwart-Wit powder (don’t know the English name for it , but it is a candy powder consisting mainly of liquorice root, which I used to love in my childhood years). Pleasant balanced with fruits as baked bananas, but also pleasantly creamy. Quite easy to drink, and forcing you to take another sip very soon. It is good, but there is some disappointing. In my opinion it lacks something which I want from an Ardbeg. Is it the ABV that is spoiling this a bit…..? Quite long finish, but also quite soft and creamy. Something I don’t expect from an Ardbeg. Even the aftertaste, when you have swallowed isn’t that powerful. Oh yes there is some ashy smoke and peat coming back to you in the back of your mouth, but again I am missing something here. Well it is balanced, it balance the fruit and the smoke quite well, but I think, if tasted blind it is more in the league of a Coal Ila or a good Bowmore then an Ardbeg despite the distinct Ardbeggian nose. I can’t keep my feelings down that this needed at least a higher ABV (55 and up) or less Marsala influence, it is a bit to soft for me. I have to admit that I expected a stunner Ardbeg, but regarding the name Ardbeg it fell short for me. So scoring isn’t easy. It is still a very good and enjoyable whisky, so trying to leave the slightly disappointment behind me: 82 points. Again I am left with the feeling of a dram which would be probably much better at a higher ABV. It just amplify my preference for Cask Strength whisky. I hope the whisky industry will pick this up, but I fear they won’t. 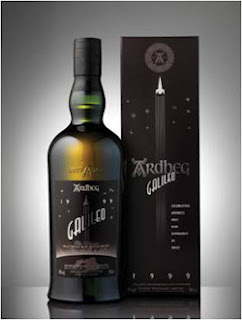 This entry was posted in Ardbeg, Islay notes and tagged Ardbeg, Ardbeg 1999, Ardbeg Galileo, Ardbeg Galileo review, Ardbeg Galileo Tasting note, Ardbeg review, review, Tasting note, whisky. Bookmark the permalink. I was fortunate enough to taste it yesterday at the press launch so just thought I’d add one comment that was mentionned. The ABV was highlighted but Mickey Heads (Manager) confirmed that this whsky is at natural cask strength – they havn’t watered the whisky down at all – the angels just had a very good share!! Lucky angels! Pitty for us as I think it would benefit from a higher ABV. Thank you for your comment! I would give it an 85 just for the smoothness and complexity compared to standard single malts but I agree it fell a bit short or lacked a little punch. However, noticing recently how much press this release got all around the world, I think they purposely made it a light fruity version to be more accessible and bring more people into Ardbeg fanhood. Just my thought.